"Outstanding blacks, contrast, and motion handling are best traits of this year's Q7 series"
The difference this year in Samsung's QLED offering and last year's Nano Crystal technology is improvements in the QDEF layer or quantum dot layer whichever you want to call it. The quantum dot layer is a stack of ultra thin film located between the LCDs (liquid crystals) and the front protective glass or plexi layer. Samsung has added a metal alloy element to the quantum dot layer that enhances brightness luminance up to 1500 to 2000 nits. Samsung has done this without destroying color volume – or the ability to deliver accurate color at very bright levels. Indeed, tests of the Q7 show that they succeeded in this endeavor. 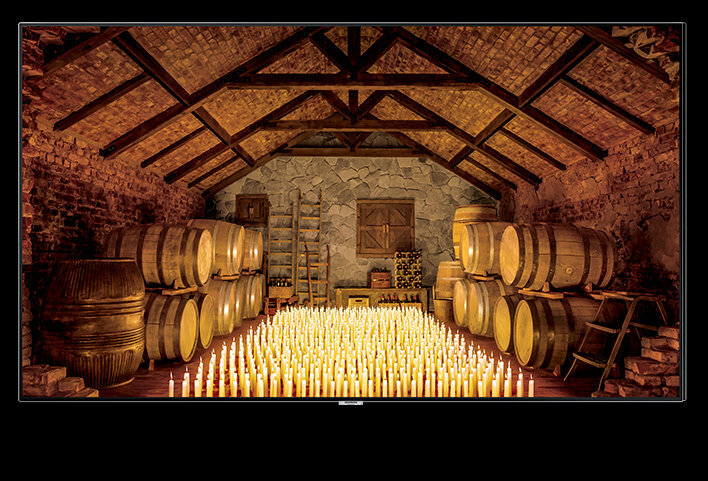 Samsung's QLED TVs can also read the interior ambient room light conditions and change the brightness needs of the TV to optimize viewing. Think dark room/light room. While adjusting brightness for room light levels technology has been around for a couple of years, this Q7 may do it best. Samsung's term for the (“local”) dimming feature in the Q7 series is Precision Black. Local dimming can offer some increased precision regarding contrast, color, and detail levels needed for each part of the screen to coordinate and excellent overall image. Since the dimming mechanism (LED lights) on the Q7 is from the edges, we cant really call it true local dimming – a term that describes a TVs ability to brighten or darken specific areas of the screen independently from one another. This feature is effectively supposed to increase contrast in various areas of the picture. In the Q7, it at times darkens the screen a lot, especially on the higher settings. Unfortunately, the edge lit LED backlight is a major hindrance to good local dimming. Edge Lit dimming has never been one of the best features to me. I like the full boat, full-array micro dimming much better which has a major impact on contrast. The manipulation of the edge lighting as in the Q7 to my eyes only marginally impacts contrast in the picture and is not much of an improvement. I recommend tuning the setting to low for this feature. The big focus TV feature for 2017/2018 is again HDR (High Dynamic Range). HDR extends the range that a pixel in an LCD TV can show. This applies to the brightness and luminosity of images. Contrast is enhanced by increased brightness rather than deeper blacks. Rather than just increase the brightness of the picture overall though, the real purpose of HDR is to increase contrast in various image areas of the picture. It improves the presentation in the brighter parts of the picture and this creates more contrast with surrounding darker parts of the picture. Since picture contrast is one of the primary features in improving perceived depth, HDR is considered a major picture quality improvement even though it may not increase the overall contrast of the panel a lot. Bright colors receive enhanced purity. A good HDR image will show better shadow detail, and the scenes that you will notice the most are those with light illuminating images, especially outside sunlight effects, or a room that has sunlight coming in through a window and illuminating parts of the room. This picture quality improvement varies quite a lot with the HDR content being viewed. The Q7 tests excellent in accuracy with HDR content. It has a wide color gamut and captures even the smallest nuances in color. It gets and A in this area. From off center the Q7 has the normal problems associated with LED backlit, LCD TVs despite Samsung's all out efforts to improve it. Black levels fade as does color saturation. The Q7 panel's beautiful picture presentation loses some of it's luster. Ever wonder if the picture quality is better on a 4K UHD TV with a standard definition or HD signal pumped into it? The answer is yes ONLY if the TV has a stellar upscaling and conversion technology built in. The Q7's new UHD remastering engine does a phenomenal job upscaling standard definition and lower resolution content. It analyzes the incoming signal, applies video noise reduction techniques, and scales up the lower resolution signal. Lastly, it enhances the detail which may be the most important bit. Anyway, the end result is that yes, you get a much better picture. I would place the Q7 as good as any TV we have tested in this area. This is one of the big differences of the very top end TVs. Better processing produces a great picture quality even with streaming video signals. Digital Clean View is a feature that works well to clean up image edges and create a sharper looking picture from poorer resolution content source. 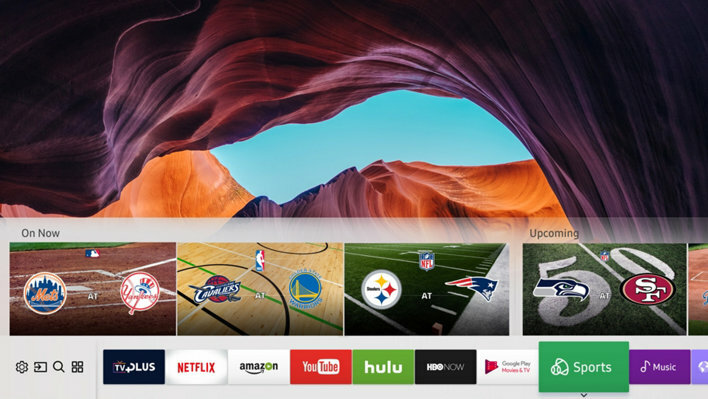 You can turn the feature off for good HD or 4K content. This figure represents an enhanced Hz rate for the 120Hz panel. 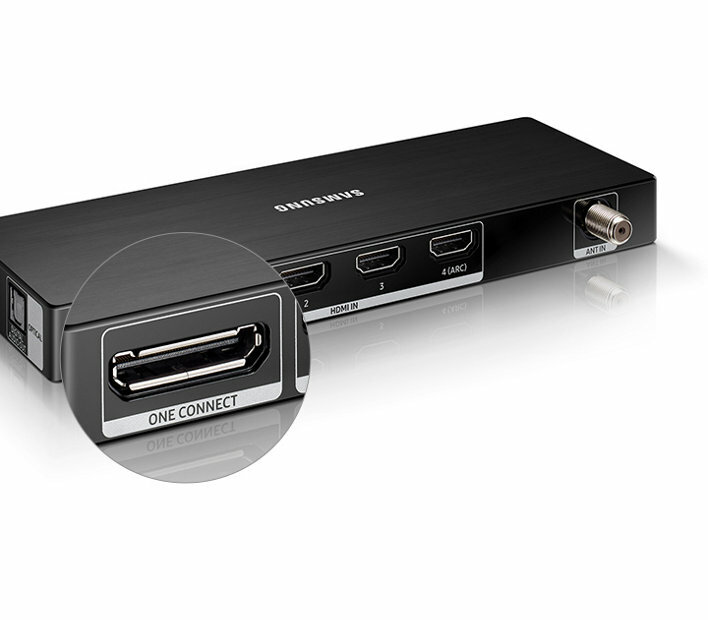 By manipulating the powerful LEDs Samsung is able to produce an “effectively” faster refresh rate. The input lag is excellent at around 20ms when the TV is in Game Mode. The Q7 does a great job with fast motion images on screen. This TV is great for sports and gaming and also has no image retention issues for gamers. The Samsung Q7 comes with 5 preset picture modes which are Movie, Natural, Standard, Vivid, and then the separate Game mode. Obviously, Game mode is your choice to cut down on input lag from games. 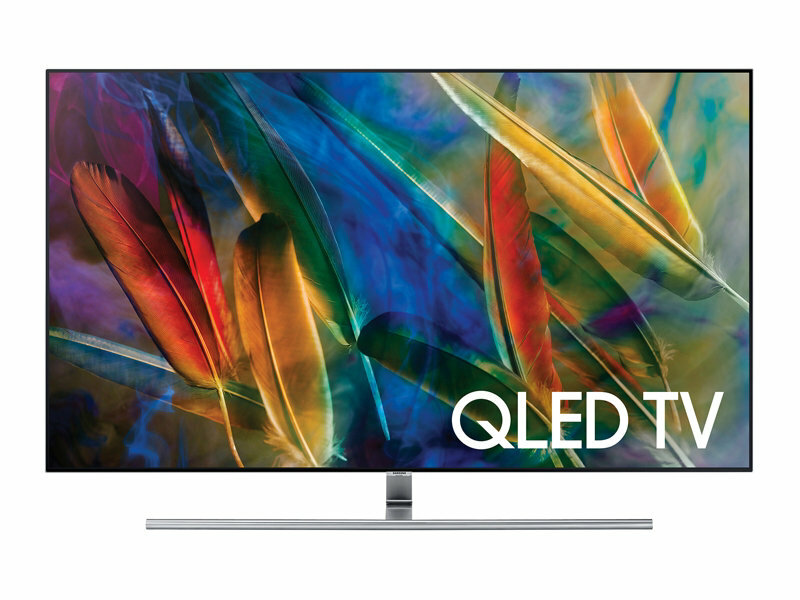 The Q7 is a gorgeous TV with almost no bezel frame, silver sides and stand, and a cavity to run your cable through in the back of the stand. Looks great from any angle. The Q7 is designed to compete with OLED TVs from LG and Sony for this year. It does a reasonably good job in some areas like upscaling of lower resolution signals, black levels, contrast, color accuracy with HDR, and appearance. Is it better than the OLED TVs? No, but it depends on what you want the most in a TV. It's a premium model with a premium look and feel and price. It's not a value hunter's dream. It's great for sports and gaming programming as well as movies.